San Antonio’s famed River Walk attracts more than four million visitors annually who come to Texas’ biggest tourist attraction for the fine dining, trendy nightclubs, and parks. Because the San Antonio’s crown jewel is located below street level, visitors must walk down any number of staircases to get there. A couple years ago, though, a few tourists had a hard time reaching River Walk–literally. Several visitors slipped and fell down one particular dimly lit staircase. One city worker even broke his ankle. In an effort to improve public safety, San Antonio officials had non-skid tape placed on the stairs. Unfortunately, the tape soon peeled off. Then with the help from Glowzone Inc., a photoluminescent manufacturer, and Balco Inc. A stair tread manufacturer, city officials hit upon a permanent solution. 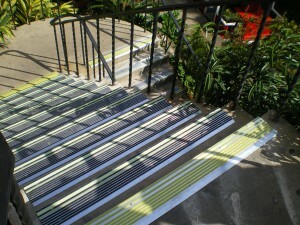 In early 2008 glow-in-the-dark, non-skid aluminum extruded stair treads were placed on the stairs. The photoluminescent material made the steps easier to see, while the non-skid additions made them less slippery. The result: Not a single accident since, said Joseph Cruz, river operations superintendent for the city of San Antonio. Photoluminescent products, once largely limited to novelty items such as glow-in-the-dark stars and cheap neon-green yo-yos, have surged in popularity in recent years with a growing awareness of their versatility, quality, and ability to save lives. Because photoluminescent, or glow-in-the-dark, products use no power, contain no radioactive materials and are exceptionally durable, their future appears exceptionally bright.